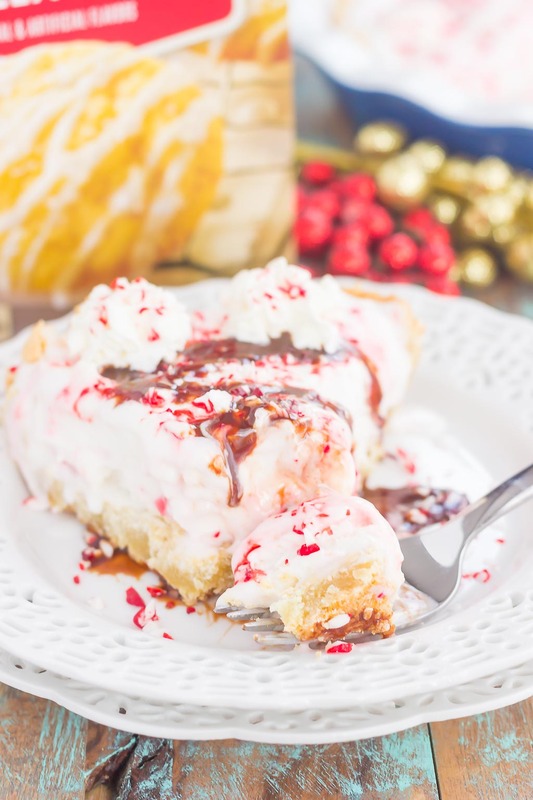 This Peppermint Sugar Cookie Ice Cream Pie is an easy dessert that’s full of holiday flavors. A buttery sugar cookie crust envelopes creamy peppermint ice cream and is topped with crushed candy canes. It’s a simple dessert that is sure to impress everyone this holiday season! We made it to December, friends! How are you feeling about that? Excited? Nervous? Happy? Ready for it to be 2018? Whether we like it or not, this year flew by and is soon coming to an end. But, before that happens, we get to enjoy all of what the holiday season has to offer. And I’m so thankful for that! Christmas movies, the cookies (oh, the cookies! ), presents, shopping, and decorations, I love it all. Well, most of it…I could do without the crowded stores and malls. But…you get the picture! Speaking of movies, what is your favorite Christmas movie? I have such a hard time narrowing it down, so here are my top favorites: Christmas Vacation, A Christmas Story, Home Alone (1 and 2), Prancer, and Elf. Plus, those cheesy made-for-TV movies on Lifetime and Hallmark channels. Even though I’ve seen those movies a billion times, I just have to watch them every Christmas! Along with some cookies, of course! I feel like cookies are the unofficial food for the holidays. Everywhere you turn, there’s another cookie to try…am I right? And don’t even get me started on those cookie exchanges! If you’ve done one before, then you know what I’m talking about. You bring a dozen or two of cookies that you made, and then come home with an assortment of different cookies from the other people who participates. So much fun, but so many cookies! Well guess what? Instead of sharing a standard cookie recipe today, I’ve got a deliciously fun twist for you! 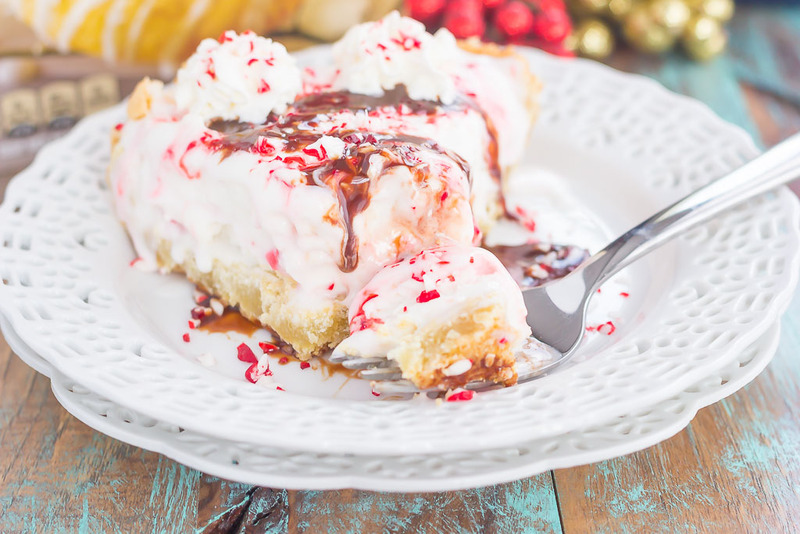 The creamy peppermint ice cream, the buttery sugar cookie crust and the sweet crunch from the candy canes make the most delicious combination! 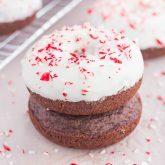 If you’re anything like me, peppermint (and cookies) are a must for every holiday. And with this unique combination, you can totally step up your cookie game this year. And you know me, I’m all about those easy recipes! 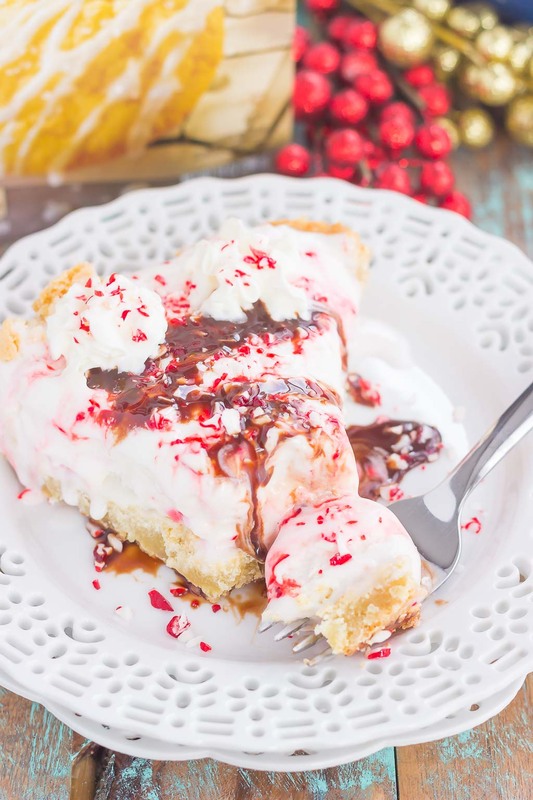 This Peppermint Sugar Cookie Ice Cream Pie literally takes just minutes to prepare, which is definitely needed during the busy holiday season. 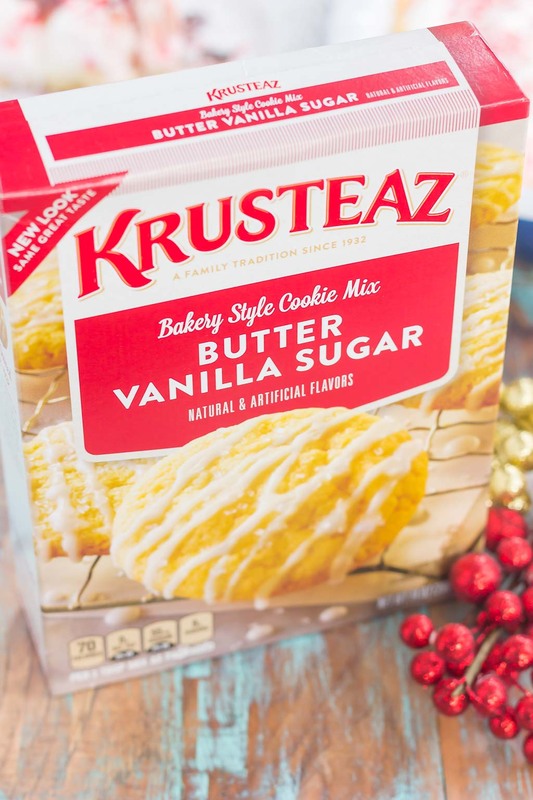 The sugar cookie crust is made from Krusteaz Butter Vanilla Sugar Cookie Mix. You all know how much I adore Krusteaz mixes (remember these Baked Pumpkin Streusel Donuts, that Blackberry Streusel Pancake Casserole, and this Blueberry Almond Poppy Seed Muffin Trifles?). I’ve been having so much fun experimenting and being creative in the kitchen, and Krusteaz has the perfect selection of mixes to help me do so! 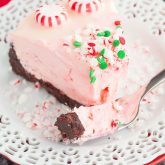 So forget those boring cookies and surprise everyone with this uniquely sweet Peppermint Sugar Cookie Ice Cream Pie. The flavors, the texture, and the simple ingredients will have you coming back for more! P.S. Are you preparing for a cookie swap this holiday season but don’t know what to make? Well Krusteaz is here to the rescue! You can take their short quiz here to identify your cookie personality! How fun does that sound? 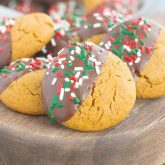 Krusteaz will give you a suggestion based on your quiz answers, plus you’ll also receive a coupon for a Krusteaz cookie mix and 10 cookie fans will win a $100 grocery gift card! To find your cookie personality, click here and have fun! 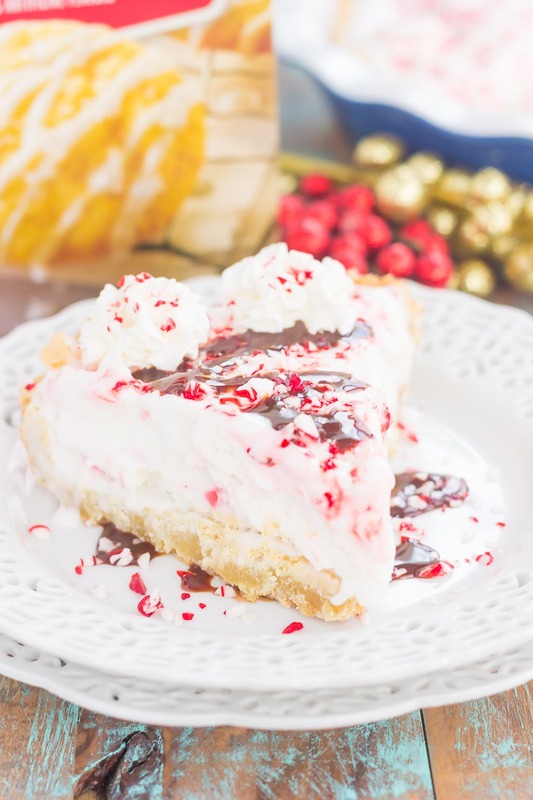 This Peppermint Sugar Cookie Ice Cream Pie is an easy dessert that's full of holiday flavors. A buttery sugar cookie crust envelopes creamy peppermint ice cream and is topped with crushed candy canes. It's a simple dessert that is sure to impress everyone this holiday season! You're speaking my love language with this dessert -- it has everything! Ice cream, cookies, pie, peppermint...Oh my! And we share a lot of the same favorite movies. Home Alone and Christmas Vacation are top picks around here! Thanks, Blair! This combines all of my favorite desserts into one! :) And yay for Christmas movies! Oh! This looks creamy dreamy, Gayle! Love the flavour combo! Love those movies too, especially Christmas Vacation! I can't wait to watch it again - thinking this weekend :) I'm slowly getting everything done and feeling less overwhelmed by it all so woot woot for that! Pinning this delicious pie! Have a lovely weekend! Thank you, friend! I remember your moose mug from Christmas Vacation! :) Hope you have a great weekend, too! This is so much better than a regular cookie! Love it!!! Great flavors and it looks so festive! Pinning to try it! Time needs to slow down a little! Thanks for the sweet comment, Cheyanne! I hate to say it but it doesn't even feel like Christmas yet because it just came too fast. I guess I need to get baking -- that would help! 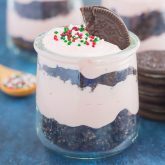 This is such a fun holiday dessert too. I can never turn down anything peppermint and that sugar cookie crust is so fun! Thanks, Marcie! Peppermint and sugar cookies make the best combo! Oh my gosh, I LOVE the sound of that sugar cookie crust! And peppermint ice cream filling is obviously what DREAMS are made of. This is like the most perfect holiday pie, Gayle! Thanks, Sarah! Cookie crusts are the best!